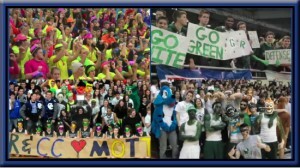 Nine Connecticut high schools submitted entries in the inaugural CAS-CIAC Battle of the Fans competition, producing short videos showcasing the spirit and sportsmanship of their student cheering sections. The submissions have been reviewed and three finalists have been named. Check out the top three videos and stay tuned to learn which school takes home the top prize for best sports fans! The winner will be recognized at Mohegan Sun Arena during the CIAC basketball championships!